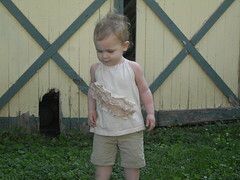 Here is another one of those halter tops that I test sewed this week. This time I used an old tank top that doesn't fit anymore. I dyed it using tea. That was kinda fun. I've dyed my far share of yarn and fiber but never fabric. I think I'll be have to play around more with dyeing fabrics. I still have tons of different colors! Anyway. I like how this one turned out, but I do wish I would have had more fabric to make the ruffles longer.